In honor of The Coordinating Center’s 35th year anniversary, coworkers are participating in The Center’s Year of Service initiative. Renée Dain, VP, Business Development and Social Innovation and initiative organizer said, “Finding time to give back to the community and to make new connections has been proven to improve not only the lives of others, but your own life as well. 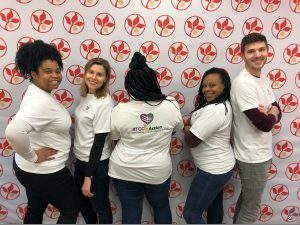 By volunteering with coworkers in our local community, we will promote team building and have the opportunity to put The Center’s values into action.” We are excited to announce that The Coordinating Center’s Year of Service will now run annually! As part of the Year of Service initiative, coworkers are volunteering across the state to help people with disabilities, housing instability and mental health challenges, as well as organizations that support animals and the environment. To date, coworkers have worked with a diverse group of organizations including Maryland Food Bank, A Wider Circle, Itineris, and Maryland SPCA. Look for #TCCinAction on our social media accounts to follow all the great work we are in doing in the community! Do you know of any organizations in need of volunteers? Contact Renee Dain.